Don’t get me wrong, I loved every second of it and probably gonna cry a river when the school gates close next Monday, but it requires a lot of imagination to entertain these little devils. We painted real masterpieces with our fingers, crafted precious noodle jewelry, bought a fish now baptized as Hippopotamus, planted a black bean seed that now is getting gigantic and has to be transplanted to a vase, put our bathing suits to play in the shower on a rainy day, watched Snow White, The Lion King and The Little Mermaid a thousand times, baked cookies, draw on the living room wall with a red crayon (well, my participation on this one was only in the cleaning part) and made blackberry ice pops. These are pretty easy to put together, great to make with kids. 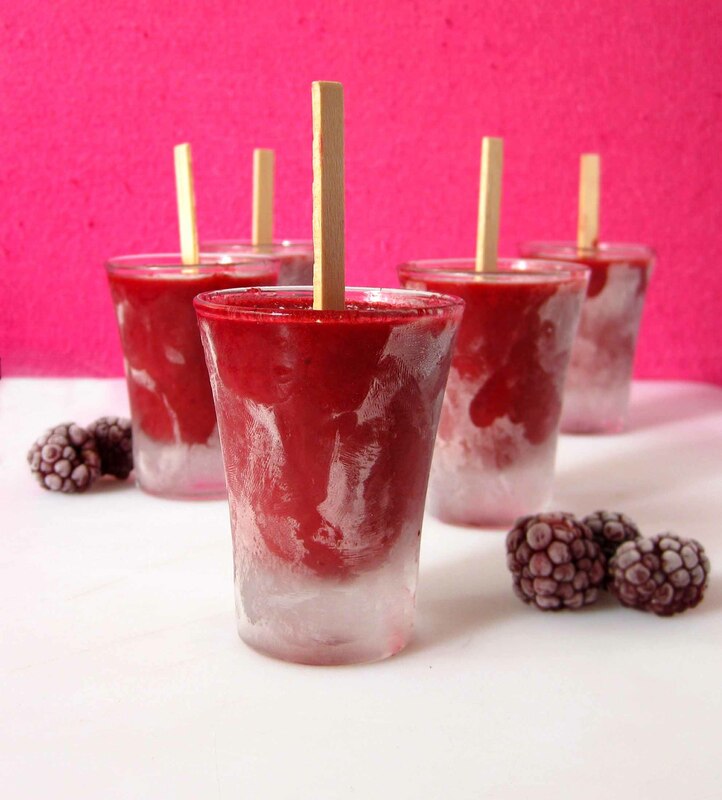 I don’t have ice pop molds – the shot glasses worked very well and I believe small dixie cups would work too. For you guys on a diet, the sugar can be substituted by artificial sweeteners, to the taste. Place the fruit and sugar in a food processor or a blender. Add hot water and beat for several minutes, until the mixture turns into a purée. Pass through a sieve, pressing well, and discard seeds. Transfer the mixture to the glasses and place the pop sticks. Freeze for at least 4 hours. To release the ice pops, dip the glasses in warm water for a few seconds. * There was a discussion on twitter if these are blackberries or mulberries, and I couldn’t find a reliable source of information to identify them. Here in Brazil they are all called amoras. Feel free to correct me anytime! i love popsicles, especially the ones with berries. YUM! 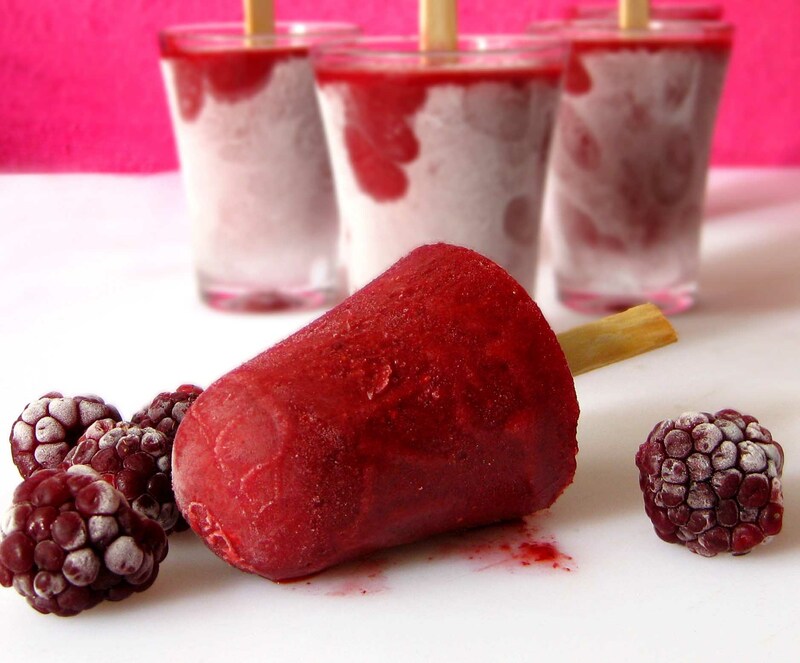 I love blackberries and have never seen blackberry ice pops. They look delicious! Wow… such beautiful color and a great photo and recipe… those berries are perfect!! These pictures are beautiful! I saw them on TasteSpotting or FoodGawker (or both) yesterday. I should have known these gorgeous pics were yours!!! These are so so good especially since there is an abundance of blackberry’s here in the summer. I think raspberries??? Blackberries are the black version of this. Amoras I love thee… and pops I love thee more. These are beautiful!! I actually grew up in Ecuador, eating “moras” which look exactly like this and sound almost identical b/w the spanish and portuguese. My understanding is that a mora is not quite a blackberry. That they are their own berry. I grew up drinking fresh, homemade mora juice (delicious!) but I will say that the flavor is different than a blackberry. i will visit his blog more often.